This family hotel enjoys an excellent location in a residential area 400 metres from the beach at Levante and near the old town of Benidorm. Located just 300 m from Benidorm's Levante Beach, this hotel enjoys a sunny terrace with swimming pool for adults and children as well as a fun entertainment programme and great restaurant. Benidorm Apartments has been entirely renovated, offering 3 different types of apartments for rent, located 150 metres from Playa de Levante, in the heart of the British area of Benidorm. Set just a 3-minute walk from the beach, in an unbeatable location in Benidorm, Apartamentos Michel Angelo boasts views of the swimming pool and park. These horizontally designed apartments are located in a residential area on the east side of the Playa de Poniente Benidorm. 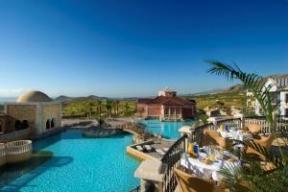 The rooms are large and comfortable and have excellent views. This family-friendly hotel is set in the heart of BenidormÃ¢â‚¬â„¢s old town, overlooking L'AigÃƒÂ¼era Park and just a 500-metre stroll to the famous, sandy beach of Playa Levante. 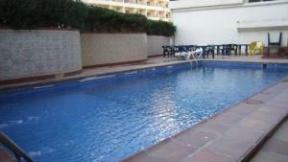 These modern Benidorm apartments are located just 700 m from Benidorms beach and have an outdoor pool to enjoy. Relax in the bar-cafe with international TV and cuisine. Each apartment has a private balcony. 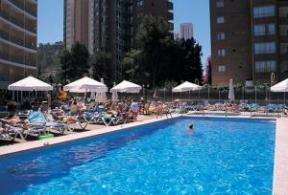 Benidorm Hotel boasts superb architecture, is set in a privileged location between the mountains and the Mediterranean, and has several swimming pools and 2 golf courses. Hotel Torre Dorada located just 200 metres from Benidorm's Poniente Beach and with privileged views of the sea and mountains, this family-friendly hotel has a great, outdoor pool and super buffet restaurant. The MeliÃƒÂ¡ Benidorm is an impressive resort set in 9500mÃ‚Â² of gardens, 500 metres from Levante Beach, and boasts fantastic facilities including 2 lagoon-style swimming pools. Benidorm a brand new apartment complex sits on the slopes of the Sierra Helada, only 200 metres from the fantastic beach of Playa de Levante in Benidorm. Set overlooking the Mediterranean Sea and the fine sands of Levante beach, the Hotel Cimbel provides a stylish ambience for a family holiday in the sunshine in the centre Benidorm. 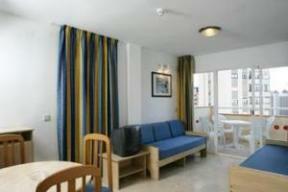 The hotel is located in a residential area Ã¢â‚¬ËœRincÃƒÂ³n de LoixÃ¢â‚¬â„¢ 600 meters from Levante Beach. .